Yellow is such a bright and vibrant color that it’s the perfect choice for adding a little oomph to your wardrobe. It has great and powerful properties that create feelings of joy and happiness, and it’s a fantastic color for anyone who needs a little cheering up! But you don’t have to go out dressed like a banana to harness those happy feelings, just get yourself a little accessory and you will be feeling the cheer in no time. A lovely yellow necklace is just what you need. You can be stylishly subtle or go all out with a fabulous statement piece, it’s up to you. But one thing’s for sure, a yellow necklace will definitely brighten up your world, so here are 9 yellow necklaces you need to see. 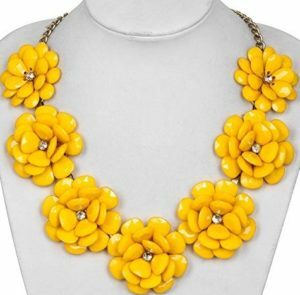 Now, this vibrant yellow necklace is sure to add some color to your wardrobe. It’s bright, fun and trendy, and will be an excellent statement piece to add to your collection. This gorgeous necklace features multiple yellow beads strung together and woven over each other to create a shimmering plaited effect. The bright yellow beads are interspersed with translucent yellow beads, which creates a water droplet effect and helps it to stand out on your neck. The beads merge together at the back and are set in a silver tone metal, with a silver tone metal chain extender tail and clasp. The necklace measures a total of 16 and a half inches in length but can be shortened with the adjustable chain tail to just over 13 inches. This means you can wear it either as a necklace or as more of a choker style piece. It is a fabulous necklace to wear either during the day or in the evening and will add a chic splash of color to lots of things in your wardrobe. 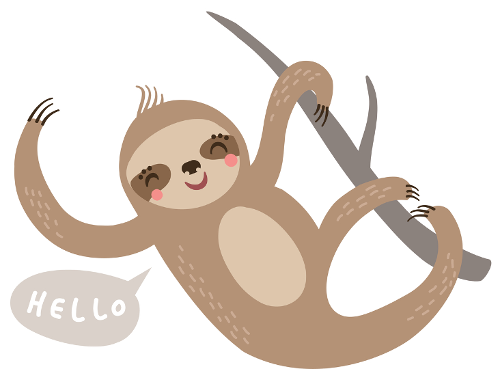 It will look extra stylish with neutral tones and trendy safari colors, and will also look great with black and white! If you’re looking for a pretty piece of jewelry that will stand out and look chic, then this yellow necklace from CharmStory is just the thing you need. It’s not only a wonderful statement necklace but it’s a fabulous necklace for adding a beautiful bright element to your wardrobe. This stunning necklace has seven large yellow flowers crafted with multi-faceted yellow bubble beads, which gives the necklace its bold three-dimensional look. Each flower has a little clear rhinestone crystal in the center, giving it added sparkle. The chain is an antique gold tone metal and measures 22 inches in length, making this necklace quite a long piece that will sit quite low when it’s on your neck, as opposed to being more of a choker style piece. This necklace will look so stylish with summer dresses and will add a colorful pop to your plain casual tops. It has such a tropical feel that it will be the ideal statement necklace for any pool party or outdoor wedding. You could also team it with a pretty maxi dress for an evening stroll along the beach! So, you’re searching for an exquisite yellow necklace that will sparkle and look elegant no matter what you wear it with? Well, with this stunning lily necklace you can search no longer! 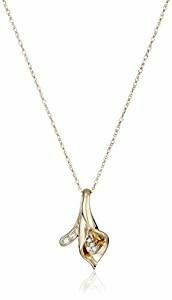 This beautiful necklace features a 10 carat yellow gold pendant carved into a delicate Calla lily with genuine white diamond accents to give it that extra radiance. The pendant measures just around three quarters of an inch long, so it’s large enough to see the details in the design but dainty enough to wear everyday. The fine chain is also 10 carat yellow gold, to match the pendant, and is a delicate rope chain, with a spring ring clasp. The chain measures 18 inches long and it enhances the look of the flower pendant because it is so fine. This stunning necklace would be an elegant addition to your jewelry collection and would look fantastic with anything in your wardrobe. You could wear it to work, to school, or out to a formal event. It has the right amount of sparkle to add a chic and stylish look to anything in your wardrobe! It would also make a beautiful gift for a loved one, and comes with a special little gift box. Now, this is the ideal necklace for anyone looking for a beautiful gift for their mother or for a first time mother. 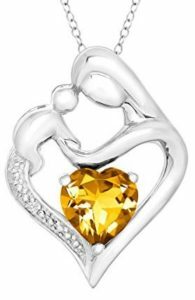 Citrine is one of the birthstones for November, so for any new mother of a November baby, this necklace is perfect! This gorgeous necklace features a polished sterling silver pendant crafted into the shape of a heart with a mother and baby design forming the closing section of the top of the heart. Within the open heart is a beautiful yellow citrine stone, cut in the shape of a heart, which sparkles radiantly when it catches the light. One side of the silver heart pendant is encrusted with genuine white diamonds, giving this necklace even more radiance and adding just a touch of glitz to this delicate piece. The chain is a fine sterling silver cable chain, measuring 18 inches in length, with a spring ring clasp closure, so it’ll stay securely on your neck all day long. The pendant measures just under an inch long and just over half an inch wide, so it’s an ideal size for wearing everyday. This would make a fabulous gift for an expectant mother at a baby shower or just as a gift to any mother to let them know how special they are at any time of year. This is an elegant piece of jewelry that will add a subtle touch of color to your wardrobe, as well as a delicate sparkle that will keep you looking chic. For anyone who loves butterflies, this darling yellow necklace is just the thing. It’s colorful, shimmery and super cute! I mean, what more you really want in an accessory! This fun yellow necklace will definitely catch your eye, with its large silver tone metal pendant carved into the shape of a gorgeous, exotic butterfly. 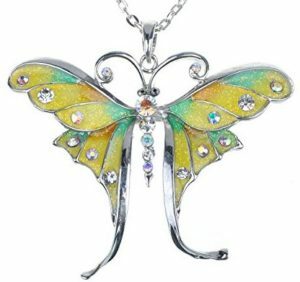 The butterfly features hand painted enamel wings in a beautiful shade of yellow, with green and orange detailing for added depth, along with a generous dusting of glitter. The wings are decorated with sparkling rhinestone crystals, which give the necklace a fabulous glitzy look. The butterfly’s body is made up of rhinestone crystals, and there are crystal details on the eyes and antennas. The chain is a polished silver tone metal that goes well with the large pendant. The pendant measures around 2 and a half inches wide, so it’s sure to stand out on your neck and be large enough for everyone to notice and comment on. This would make a fabulous necklace for adding a shimmering touch of color to your day! Brighten up your world and let your jewelry do the talking, with this fantastic yellow necklace from Jiayiqi. All your friends are going to want one after they see you wearing this! This bright yellow necklace features a bold emoji face with red love heart eyes, so you can show everyone just how much you’re loving life! The yellow pendant is made from glass and set on a silver tone metal background. It also has a 20 inch silver tone metal chain that comes with an extender chain tail, so you can lengthen the necklace by an extra 2 inches. This necklace would make a great gift for any young person who loves to express themselves through their phone! It’s a fun and colorful piece of jewelry that will get everyone talking! What’s more, you can even choose from a range of different emoji faces, so you can express yourself with whatever face takes your fancy! This adorable yellow necklace is a wonderful way of adding a bright touch of color to your wardrobe, while keeping your style looking dainty and elegant. It’s a fabulous and fun piece of jewelry for wearing everyday at any time of the year. 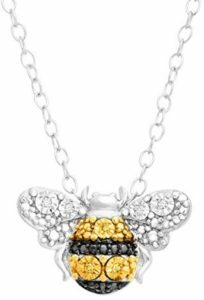 This beautiful necklace features a sterling silver pendant, crafted into the shape of a cute little bumblebee. The bee has a gorgeously detailed black and yellow striped back with genuine yellow diamonds accenting the body and genuine white diamonds adding sparkle to the detailed silver wings. This little pendant is a dainty size, measuring just over half an inch wide and just under half an inch in length, so it’s a subtle little necklace that will add a bit of glitz to any outfit. The sterling silver cable chain measures 17 inches long and benefits from a spring ring clasp closure. The chain is delicate enough to enhance the look of the pendant but is still sturdy enough for you to wear all the time. This necklace will look great with both casual and formal styles and will add a fun little sparkle to your everyday wardrobe. Its small size makes it ideal for wearing to work or school, when you just want a subtle and delicate piece of jewelry. This is a fabulous yellow necklace for anyone who needs a little bit of inspiration and encouragement in their life. It has a trendy style that will look extra sleek with almost anything in your wardrobe. This gorgeous necklace features a contemporary design with a round sterling silver pendant and within the pendant is a cluster of little yellow gold flashed sterling silver stars, designed to appear as if they are floating in the circle. The outer edge of the silver pendant is engraved with the words, “Live your own life Follow your own star”, giving anyone who wears it a little extra encouragement to follow their dreams. The chain is a sterling silver box chain, that shines as the light catches it, and measures 18 inches in length, making it a stylish length for showing off the pretty quarter sized pendant. This yellow necklace will sit like a charm around your neck, and will look look great with lots of different outfits. It’s so versatile that you can wear it to add a chic look to your casual styles but also as a delicate accessory to wear to a more formal event. Because of its trendy design, it would even look great with other necklaces, for a casual, layered look and would make a meaningful gift for any special occasion. 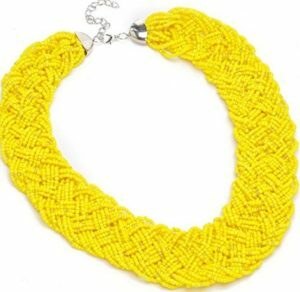 Let your fun, playful side out with this gorgeous yellow necklace from Rigant. Not only is it a cute design but it’s sparkly and glamorous too. This beautiful necklace features a white gold plated copper pendant carved into two playful little dolphins. Between the two dolphins’ tails is a radiant yellow Swarovski crystal gemstone, which stands out against the white gold plated dolphins. The pendant is a cute little size, measuring just over an inch long and around half an inch wide, so it’s a fantastic size for wearing everyday, no matter where you’re going. The chain is also white gold plated, to match the pendant and give the necklace a little more luminosity. The delicate chain measures 16 inches in length and benefits from a 2 inch extender chain tail, to give you more options over how you wear it. This necklace would make a superb gift for anyone who loves the ocean and loves those friendly dolphins. It’s a stylish way to add a little color to your wardrobe without having to adjust your outfit accordingly, as this is subtle enough to wear with any outfit, no matter what color it is or how casual it is! Wear it everyday and keep these playful dolphins close enough to remind you to always have fun!